Your Sushi in Berlin- Steglitz Enjoy our Japanese specialties at the Schloß st. in Berlin-Steglitz. Our Japanese cuisine presents refreshingly uncomplicated and define itself from it's fresh ingredients. Sushi deals up to 5€ Your Sushi in Berlin- Steglitz Enjoy our Japanese specialties at the Schloß st. in Berlin-Steglitz. Our Japanese cuisine presents refreshingly uncomplicated and define itself from it's fresh ingredients. Welcome to the japanese Restaurant Akiko Sushi! 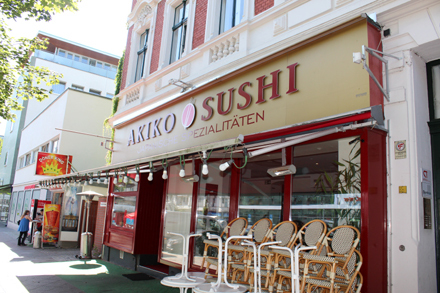 Enjoy our Japanese specialties at the Schloß st. in Berlin-Steglitz. Our Japanese cuisine presents refreshingly uncomplicated and define itself from it's fresh ingredients. Come to "Akiko Sushi" and try our delicacies. And now we wish you a " Bon appetit !" Among many other specialties, we offer good quality sushi dishes for a discount price. Happy hour menus up to 5, - € can be ordered ! Enjoy our cuisine in the stylish design - indoor as outdoor erea. You can make a table reservation under the tel number 030 79744564.